Sports Authority of India (Sports Authority of India, Aurangabad), Aurangabad Published Job Notification for Physiotherapist Posts. 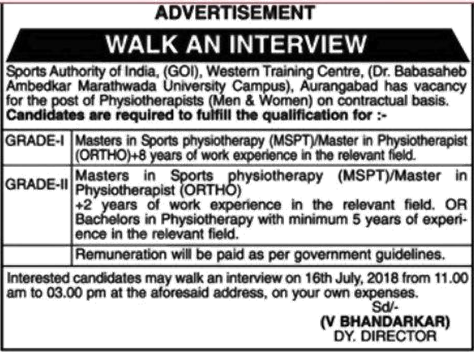 Candidates who wish to apply must look at Sports Authority of India Physiotherapist Recruitment 2018. Eligible candidates can join Walk – in Interview on 16th July 2018. Education Qualification: Masters in Sports physiotherapy (MSPT) /Master in Physiotherapist and More. For Post wise Education Details follow the detailed advertisement. Interested & Eligible candidates may attend for walk in interview along with all the documents addressed at Sports Authority of India. (GOl). Western Training Centre, (Dr. Babasaneto Ambedkar Maraihwada Unrversity Campus), Aurangabad. Starting Date, Last Date to Apply Offline at Sports Authority of India, Aurangabad which candidates should be remembers as follows. Walk – in Interview on: 16th July 2018.